This is the perfect accompaniment to the perfect curry. Try it with some of the Burmese curries I’ve posted. It’s unusal and delicious. Peel and core the cucumber and cut into batons. Set aside. Dry roast the sesame seeds in a pan for 1-2 minutes until aromatic. Set aside. Heat the sesame and peanut oil in the same pan and when fairly hot, add the onions and garlic. Fry until browned and crispy (not burned) 8-10 minutes. Remove and drain on paper towels. Add the sugar, turmeric and salt to the oil and fry for 1 minute. Add a couple of tablespoons of vinegar. Cool. 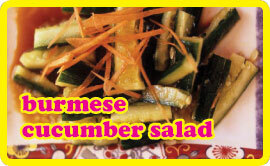 Sprinkle the onions over the cucumber then the oily juices from the pan then finally sprinkle with sesame seeds. Not really great on its own but awesome as an accompanyment to a meat or fish curry together with some rice or bread.